The exploration of ancient enigmas has generated a lot of excitement and controversy since the 1970s, providing material for best-selling books, films and TV programmes. Hearing a recent interview with Graham Hancock, well-known in this field, prompted me to look into its appeal. His current book ‘Magicians of the Gods’ sets out to prove that an advanced civilization was destroyed around 11,600 BC by a global cataclysm caused by fragments from a comet striking the earth – which leads us to one of the earliest mysteries: Atlantis. The tale of the lost continent was supposedly told by Greek wise man and poet Solon, who received it in Egypt, and is cited by Plato in his works ‘Timaeus’ and ‘Critias’. Anyone who explores these questions is likely to be dismissed as a ‘pseudo-archaeologist’, and they and their advocates seen as cranks or even frauds. People like Erich von Daniken certainly have not helped. But providing any conclusions are accompanied by words such as ‘beyond reasonable doubt’, and a theory is not passed off as hard fact, then it is at worst part of the myth-making tradition. The development of a myth has always been an ongoing process, especially in oral cultures. My aim is not to try and prove, or debunk, any specific theory or discovery but to explore the phenomenon itself, and the various ways of viewing it. Glastonbury, where I live, has claimed more than its fair share of ancient mysteries, and what some would describe as pseudo-archaeology has been going on for a very long time. In 1191 the monks at the Abbey announced that they had found the grave of King Arthur, based on information given by ‘an ancient Welsh bard’. The find is usually regarded as a publicity stunt to attract pilgrims to the Abbey to help pay for rebuilding after a disastrous fire in 1184, though archaeologists Leslie Alcock and Ralegh Radford believe the monks’ claim was genuine. Following the ‘discovery’ Glastonbury became identified with Geoffrey of Monmouth’s Isle of Avalon where, according to his ‘The History of the Kings of Britain’ (finished c.1136), Arthur was taken after the Battle of Camlann. Where are the bones now? Some DNA testing would prove interesting. And a lead cross, supposedly found in the coffin, was last seen in Glastonbury in the late seventeenth century. Perhaps it is not lost, but simply waiting to be rediscovered! In Geoffrey’s work there is no distinction between history and myth; the past exists in an ancestral storyworld where actual kings and legendary ones are treated in the same manner. Though it is possible that the text contains knowledge of prehistory, passed down through the generations and hidden within the fantastical tales. Geoffrey gives an account of Merlin transporting the stones of The Giant’s Ring (Stonehenge) from Mount Killaraus in Ireland to its present location, which is strangely similar to what modern research has discovered about how the bluestones were brought by sea and overland from the Preseli Hills in Wales. Archaeology is often not about revolutionary finds, but dedicated to learning about everyday life and ordinary people, though the possibility of a dramatic discovery gives the subject an aura of glamour. Then there is the highly speculative, which cannot be proved, but often cannot be disproved either; and even conventional archaeology involves educated guesswork and imagination to bring the past to life. Moving from one end of the scale to the other, there are no sharp dividing lines. In 1829 a seven year old boy named Heinrich Schliemann, who had been raised on Greek myth, received a book as a gift. Seeing an illustration depicting ancient Troy, he declared that one day he would discover the lost city. After accumulating a fortune through business ventures he set out to achieve his great ambition, ignoring the doubts of many contemporary scholars who believed that the tale of the Trojan war was little more than myth. When he excavated the mound at Hissarlik in Turkey, Schliemann found the evidence he was after – nine layers of ruins where ancient cities had been destroyed and rebuilt. Finally, his childhood dream had been realized. On the negative side, the city of Homer’s epic was not represented by the layer Schliemann believed it to be, and his excavation methods would leave modern archaeologists horrified. He also made off with a large amount of golden treasure, smuggling it past the authorities. So, if the mythical Troy could be found, why not evidence for Atlantis? Or the Holy Grail, the Ark of the Covenant, etc.? This is the area where fact, myth and quest meet. As humans we naturally seek ways to expand our horizons on all levels: physically, mentally and spiritually. It is the reason why the quest story is found in myths worldwide. The reason why, now that there are no new lands to discover on this planet, we explore outer space. Why, in the age of science, spirituality has never lost its power. The thought that a site, artefact, or a truth of immense importance to the world could still come to light – something that could heal, inspire, provide spiritual revelation, or give humanity a ground-breaking insight into the past – means we feel personally involved when an investigator goes in quest of an ancient mystery. A myth and the exploration of it gives a sense of meaning: that all life is interwoven, a connection to our ancestors and to the realm of the gods. Also, the shared study of a subject, for example Arthurian tradition, creates close bonds, and visiting the reputed location where an event took place or where a hero is buried becomes a pilgrimage. Then there is the dream of making that powerful discovery oneself. It doesn’t have to involve exotic travel – the answer could be right here. Anyone can carry out research locally, pick up clues, piece things together from documentary sources as well as from the land. The human brain is geared towards problem solving, following complex trains of reasoning, making ever more sophisticated (and sometimes destructive) inventions. We need to find patterns, love fitting together the pieces of an intellectual jigsaw. This is another of the appeals of an ancient mystery – think of ‘The Da Vinci Code’. Perhaps it is not ‘real’, in the sense of being physically created by a Neolithic culture around 5,000 years ago, as Katharine claims, but exists on another level of reality. When the Glastonbury Zodiac is explored through inner journey, combined with visiting the places associated with the signs, it becomes a tool for connecting with the spirit of the land at each site. What about the Grail, which according to Glastonbury legend was brought here by Joseph of Arimathea. What exactly is the Grail? Depending on source, it is a state of enlightenment, the cup of the Last Supper, a dish bearing a severed head, a stone or the bloodline of Christ. With this in mind it is impossible to find because it cannot be identified as any one thing. On the other hand, if the Grail represents a spiritual state, then it is possible for any true seeker to achieve. Even if there is no artefact buried under Chalice Hill, for those who find illumination or healing here, it does exist in Glastonbury. Many investigations into the mysteries of antiquity end inconclusively where physical proof is concerned. Does the Ark of the Covenant lie in a chapel beside the church of St Mary of Zion at Axum, Ethiopia? Whether it does or not, the account of Graham Hancock’s travels in search of it in ’The Sign and the Seal’ is an inspiring modern tale, as much about the journey as the destination – the lesson of any true quest. My particular interest is the Labyrinth. I know from personal experience how compelling myth-making can be and how evidence can take me by surprise by slotting into even the most speculative theory. But that is material for another article…..
Taliesin is a celebrity amongst bards: famous for 1,500 years. In Wales he has a high profile, with an arts centre, journal, university society and street named after him. Outside Wales, I discovered that few people know of him. The roots of his craft lie in the remote past, long before the written word, and over recent centuries poetry’s popularity has waxed and waned. Byron, for example, had a fanatical following, reminiscent of a rock star, and the beat poets were heroes of the counterculture. But poetry has often been regarded as pretentious, inaccessible or the province of dreamers. Currently, there is a surge of interest – especially in performance poetry. With spoken word stages at festivals, poetry slams, and the cross-over with music, it is embraced as exciting and relevant. In early oral cultures bards were both entertainers and carriers of tribal memory and wisdom. Their minds were the libraries, the digital storage of their day. As performers they inspired the community in an age when life was short and brutal, their words bringing escapism, and immortal fame to those whose deeds they recounted. Their power was so great it was regarded as magical, and the bard was honoured even above kings. However, the names of very few ancient bards have come down to us. So why is Taliesin remembered? He must have been special, uniquely gifted. When I started thinking about writing a historical novel, he stepped out of the mist of ages and my relationship with him began. Fascinated by his work and legend, I wanted to bring him to wider attention, and to explore who this man was. Beyond the fantastical ‘Hanes Taliesin’ (‘Story of Taliesin’) found in Lady Charlotte Guest’s translation of the ‘Mabinogion’, and a collection of mysterious poems attributed to the bard, there exists a historical figure who flourished in the 6th century, whose eulogies, or praise poems, still survive. My fictionalized character is evoked from these sources. Whilst writing, there were times when I thought ‘so that is what really happened’ as scenes appeared to my inner eye like news footage of the Dark Ages. It felt strange as I snapped back to reality, reminding myself that the ‘insight’ was merely imagination. ‘Radiant Brow’ tells the tale of Taliesin’s quest for identity as he rises in prestige to become Primary Chief Bard of Britain. Abandoned by his natural mother and taken in by the royal clan of Gwynedd, throughout his life he remains an outsider: both revered and alienated. At first he is driven by a need to prove himself, but guided by his muse, the goddess Ceridwen, he directs his powers to the cause of his people as they fight Anglo-Saxon encroachment. Increasingly, this dedication brings conflict, compromising his personal relationships and demanding a degree of sacrifice which almost destroys him. In the novel, his struggle shows the emotional weight of holding great power whilst haunted by an underlying insecurity, and the price that he must pay to follow his destiny. Historically, Taliesin is mentioned in the ninth century ‘Historia Brittonum’ as being renowned at the same time as the bards Talhaearn Tad Awen, Aneirin, Bluchbard and Cian. But most of what is known about him has its source in his own works. These would originally have been told orally from generation to generation, until they were written down by a cleric in the eleventh century. They are now contained in the late thirteenth century manuscript known as ‘The Book of Taliesin’. Reading them, although not in their original form, brought a sense of connection through the centuries, an immediacy which made me feel that I was dealing with a living, breathing person. I built scenes around Taliesin’s graphic description of historical battles and drew on his depiction of a warrior elite. As bard to several chieftains, he was probably one of the first to compose in Cymric, which had evolved from the more ancient Brythonic language. Most significant of his royal patrons was Urien of Rheged (Cumbria), though Taliesin also composed for his son Owain, King Cynan Garwyn of Powys and Gwallawg, Lord of Elmet (the area around Leeds). 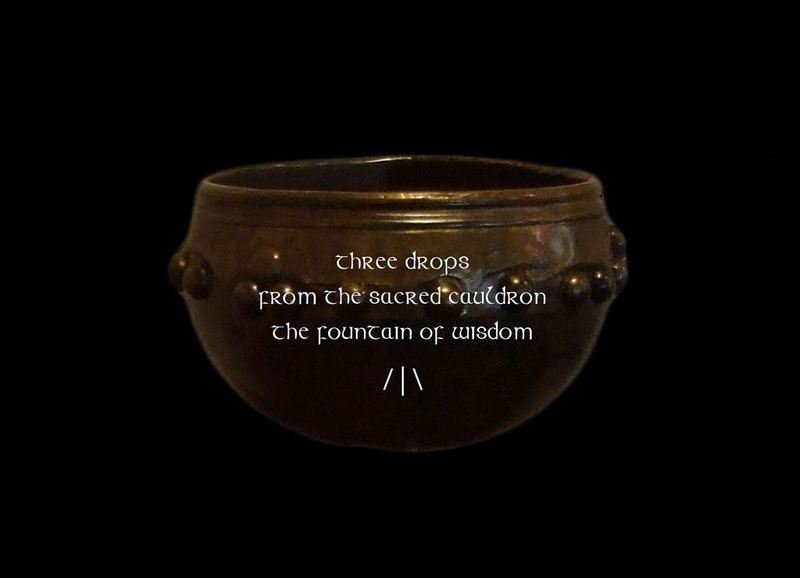 Alongside the twelve eulogies, which literary scholars agree are by the historical bard, ‘The Book of Taliesin’ contains a number of other poems involving shamanism, mythological reference and magic, which have inspired the visionary episodes in ‘Radiant Brow‘. These poems are almost certainly not composed by Taliesin the eulogist. Instead, they are the product of an oral tradition spanning centuries but not recorded in written form until Medieval times, and they may even preserve the remains of an ancient belief system. They have been linked with the bard to give them credibility by later followers of the tradition, who were seeking to preserve it. The beginning of my novel and the initiatory sequences re-imagine episodes from the ‘Hanes Taliesin’, which was first written down in the sixteenth century by a bard named Llewellyn Sion. It was on this that Lady Charlotte Guest based her translation, assisted by the Rev. John Jones, and referring to an earlier translation by Dr Owen Pughe. The tale tells how a sorceress named Ceridwen (the clerics’ way of describing a pagan goddess) employs a boy named Gwion Bach to stir the cauldron in which she is brewing an elixir of inspiration for her son Afagddu, to grant him wisdom to compensate for his extreme ugliness. When a drop of the boiling liquid splashes onto Gwion’s finger he instinctively puts it in his mouth, gaining the gift intended for Afagddu. A shape-shifting sequence follows, as the enraged Ceridwen pursues Gwion, until, taking the form of a grain of wheat, he is consumed by the goddess in the form of a black hen. Nine months later, she gives birth to a beautiful infant, a Mabon archetype or child of light, who shines that light into the world, and whose symbolic birth, therefore, occurs at the start of the Celtic summer. Though Ceridwen intends to kill him, seeing his beauty she cannot bear to carry out the deed, and instead sets him adrift in a leather bag. When it becomes trapped in the salmon weir belonging to Gwyddno Garanhir, Gwyddno’s son Elffin, regarded as a fool and a failure, saves the boy’s life. To Elffin’s surprise the child immediately begins to compose poetry, promising that his rescuer’s luck will change. and goes on to recount many past transformations. There are two possible ways to interpret the shape-shifting sequence, and its variations that occur in several poems from ‘The Book of Taliesin’. The first, that it represents a series of incarnations, based on the druidic belief that each soul inhabits both animal and human forms on its spiritual evolution. The second, that it describes initiation into the bardic mysteries, during which the shaman-bard enters a state of trance, experiencing direct identification with all aspects of existence. The theme of pursuit recalls the testing of the initiate by the initiator, pushing him to ever deeper levels of knowledge. Through Ceridwen, goddess of transformation, the initiate dies to his former self and is re-born a bard. Even as late as Medieval times, bards who aspired to the Chair of Song acknowledged Ceridwen as their mentor, and symbolically drank the elixir of inspiration from her cauldron – the prototype of the Arthurian Grail. 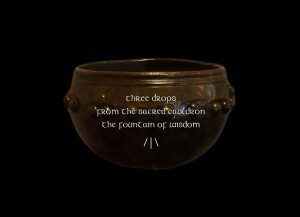 ‘The first word from the cauldron, when was it spoken? By the breath of nine damsels gently warmed. With their breath, the nine muses infuse the vessel with the flowing spirit of inspiration, or Awen. The initiatory quest to achieve this gift is paralleled by the Underworld journey described in ’Preiddeu Annwn’ – a journey from which only seven returned. That Taliesin was held in high regard is clear from his list of royal patrons, and the twelve eulogies which survive are filled with vitality and vivid detail. How exciting it would be to access the whole of his creative output, lost over the centuries. Instead, we have the esoteric poems written in his name, and the ‘Hanes Taliesin’, which have added to his aura of mystery. As man and myth combined, he represents the archetypal bard and the timeless power of poetry, as potent today as it was when he performed.